I am NOT a coffee addict. But I dare say I might become one. I do enjoy a good cup of coffee, but caffeine sometimes makes me edgy. Though I have managed to mostly avoid the lure of Starbucks, I have been known to indulge in a white chocolate mocha at Second Cup, or a French Vanilla at Tim Horton’s… and don’t get me started about Iced Cappucino in the summer!! Then I read 5 Ways to Green Your Coffee and I got the itch. So I bought myself a french press and some fresh-ground, organic, Fair Trade coffee. And I just had to share a little about the company behind my coffee. Just Us! Coffee Roasters Co-Op are Canada’s first Fair Trade coffee roaster. They’re located in beautiful Wolfville, Nova Scotia, a small town nestled along the Minas Basin, at the very tip of the Bay of Fundy. I actually lived there for 6 years as an undergrad student and I still think it’s the most glorious place in the world (and has the world’s highest tides). In fact, the company was founded just a year before I moved away… apparently I just missed them! Jeff managed to get through the military road blocks and past all the huge trees cut down by the Zapatista rebels to block the movement of the army. He travelled far up into the mountains to the coffee growing areas. There, he was able to see first hand the pride that the coffee farmers took in growing their coffee organically and the empowerment and dignity they derived from being members of a co-op. They said Fair Trade was the first thing that had given them real hope for a better future. Jeff came home with “good news” and “bad news”. The good news was he had found a great Fair Trade co-op that would be thrilled to sell their coffee to Canada but the “bad news” was that he and Debbie would have to put their house up as security to finance a minimum shipment of 10 tons of coffee without having a single customer. They didn’t really lose much sleep over the decision. They had such a strong belief in the combination of high quality coffee and Fair Trade – that they plunged ahead and Just Us! has never looked back. Not only are they a Fair Trade company, but the company itself is run as a co-op, with employees owning shares. They roast their own beans. They now also have several cafes around Nova Scotia, and have increased their product line to include Fair Trade organic tea, sugar and chocolate. 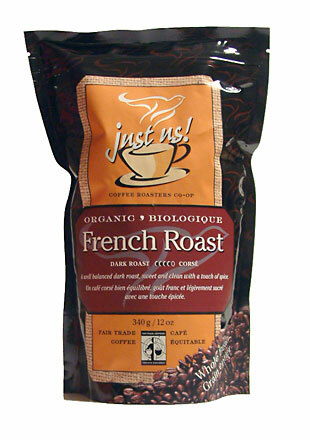 So you can indulge in Fair Trade treats for your entire family, whether they drink coffee or not. Just Us! is also working hard on incorporating sustainability practices, using local food sources for their cafes whenever possible, introducing compostable cups, installing solar panels, re-introducing native plant species on their property, using only green cleaning supplies, and converting two of their company vehicles to run on vegetable oil fuel! And they’ve got the greatest phone number… 1-888-not-them. If your local store does not carry Just Us! products, you can order directly from them. They have a wide range of coffee blends in your choice of grind, and you can even order “green” unroasted beans if you’re a true do-it-yourselfer. And I am not an addict. I’ve taken the brew-my-coffee-at-home pledge… have you? Sounds like I am going to need to call up and order some today! We were at Atlantic Christian Training Center (ACTC) in nearby Tatamagouche. They have a poster that came from you. It’s how to build a community. I thought the words were great and would like to have a poster. How can I get one? I noticed the obit for John Fuller. So sorry.